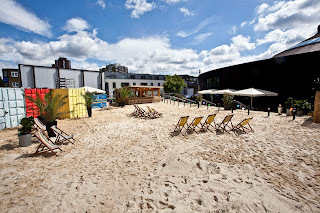 For four weeks the terrace at the Roundhouse turns into Camden Beach, sponsored by Time Out and Farah Vintage. There will be lots of sand, and also food & drink from people like Tiki, Rum Shack-A-Lak, Fishy Business, and Arkansas Cafe. Entry is free, but you might want to book your own private beach hut for you and friends - see details here. & Every Friday night Farah Vintage will be holding live music sessions - see below for full listing. "Summer has finally arrived, which is handy as the Roundhouse is about to bring back the now-legendary Camden Beach. Tucked away on our sunny terrace, this little slice of paradise in the heart of North London attracted over 40,000 visitors last year, and is back bigger and better than before. Think 900 square metres and 150 tonnes of the finest sand, end-of-the-pier amusements, deckchairs, beach huts, ping pong, live music, tasty food, ice-cold drinks and loads more. If you can’t get to the beach, the Roundhouse is bringing the beach to you! Entry to the beach will remain free this year; it gets busy though, so if you want to guarantee your spot in the sun you can hire one of our three beautiful beach huts. You’ll get your very own fenced-off area, deckchairs, drinks, BBQ platter, ice cream and more." "By partnering with the Roundhouse creative programme, Farah Vintage will provide a professional platform for emerging artists to perform live on stage every Friday night throughout the month of August. Beginning on the 2nd of August, the event aims to provide a unique opportunity for a nurtured pool of talent to develop their skills and realize their creative potential. The brand will also host a Farah Beach Hut, a small cabin catering for up to 10 people and the opportunity to enjoy the beach in style and comfort, which beach goers will be able to hire as a private area. During Farah Friday’s Live, the Farah Beach Hut will transform into a Farah Vintage clothing store where guests will be able to purchase exclusive items from the new AW13 Collection."